I'm probably overthinking things as usual. I did some work on my beater car this week (2001 toyota echo) then rotated the tires and when I reinstalled them I had a chance to try out my brand new torque wrench. I previously used a shorter 3/8" torque wrench that had a lot of years of abuse and was way off, I would typically set it to 200lbs/ft and just kept them consistent at least. This new torque wrench is the 1/2" socket and a good 24" long. I trust this one should be accurate, came with the certificate and everything. Setting it tp 70lbs/ft of torque the lugs take a ton of force and a long time to hit that torque. I also noticed that a couple lugs took a few extra turns and are showing more stud threads. See the top left lug in the pic, showing a good 5 threads whereas the rest are closer to 4. I'd just like to trust the wrench and forget it but it looks off to me. Anyone else experience lugs showing different amounts of threads once torqued to spec? My subaru lugs cover the studs so I've never seen it there. Have any studs been replaced ever? Did you say you used to torque them to 200 ft lbs with the old torque wrench? The correct torque for the lug nuts on your Echo is 76 ft lbs. At least, you should start by trying to hit that torque value. Torquing those lug nuts to 200 ft lbs on the steel wheels you show in your pic could have damaged the lug bolts, the wheels, or both. A good thing to check to start diagnosing what you are seeing is to remove the wheel and measure the length of all your lug bolts. If they do not all measure the same length, you have a problem. Agreed, you might have had some studs replaced previously so you should take the wheel off and measure them. However it is pretty near impossible to stretch them that much from overtorque, they would shear off first. It could even be that a shop broke a stud at some point and didn't tell you, just beat the old one out and beat a new one in. They aren't expensive so a shop might eat the cost and not mention it to save face. Ill bet that 3/8wrench was 200 in-lbs not ft-lbs. thats only 16ft-lbs so probably loose before. Torque them to 70ft-lbs and they will get another turn or so. Your steel wheels have spring to them and compress around the lug area. If you look at the backside the mating area excludes the holes. 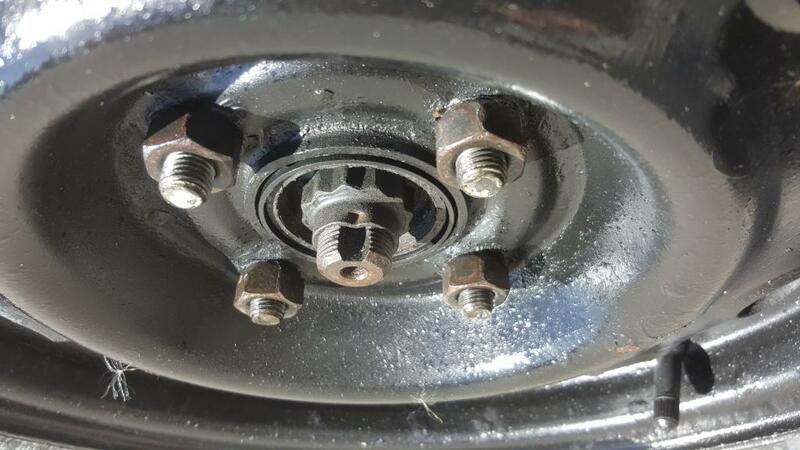 So you could have stretched/stressed the wheel which looks like an extra thread on your lugnut. How much do you weigh? If you're 140, stand on the wrench 6 inches out from the lug, then move your foot an inch to the right and you should hear/feel the click. If you think this is bad for your torque wrench use a 4-way iron and do the same thing but for breakaway torque in a ccw direction. I weigh 205, I feel like im leaning into the tip of the wrench pretty decently at 70lbs. My axle nut is specced for something like 217lbs and I couldn't get the torque wrench to click. So maybe my brand new torque wrench is off? I never bother with a torque wrench. Just put them on tight with a four-way and check them a couple of days later. 85 ft/lbs would be a typical recommendation for lug torque. Just get them as tight as you can. These are huge nuts on huge axle ends and will take much more than you can give them without damage. Lug bolts on something German? Here you need to exercise a little more care, but you don't have such a car. [quote=mcwilly]I'm probably overthinking things as usual. I did some work on my beater car this week (2001 toyota echo) then rotated the tires and when I reinstalled them I had a chance to try out my brand new torque wrench. I previously used a shorter 3/8" torque wrench that had a lot of years of abuse and was way off, I would typically set it to 200lbs/ft and just kept them consistent at least. This new torque wrench is the 1/2" socket and a good 24" long. I trust this one should be accurate, came with the certificate and everything. Setting it tp 70lbs/ft of torque the lugs take a ton of force and a long time to hit that torque. I also noticed that a couple lugs took a few extra turns and are showing more stud threads. I have never seen a 3/8" torque wrench that goes as high as 200 ft lbs. I would trust the new wrench if it hasn't been abused. Be sure to set it to 20% of full scale (or less) when storing it. No such thing as ft/lb or lbs/ft in this context. feet of leverage times pounds of force = torque. That makes sense, so I probably am overtorqued right now. Probably at 140lbs better get on that. But are you fully torqued?